With the help of the Theater Arts Department, Stevenson College and the city of Santa Cruz, we were able to launch our second UCSC production, Amen Corner. There was a charge of $3.00 per student and $5.00 per adult. Performing at the Stevenson Event Center, we had over 1500 attendants. The actors were able to obtain five-unit credits through the drama department and access to props and scenery. Amen Corner was our first outreach production taken to the Louden Nelson Community Center, performing twice at the venue with over 600 attendees. For the first time we recognized hundreds of people who have never engaged in seeing a theatrical production especially a production of color. James Baldwin’s "The Amen Corner" is a powerful exploration of ideas and spiritual dilemmas and an intensely emotional family drama. Beginning next Thursday, the UC Santa Cruz African American Theater Arts Troupe mounts a production of the 1965 drama, opening at Stevenson College and then Moving to Louden Nelson Community Center for a visit to downtown Santa Cruz. Throughout the play, which takes place in and around a tenement church in New York City, gospel music punctuates and illuminates the action, taking the congregation (and the audience) to sublime heights even in the midst of all-too-human frailty and meanness. Jonelle Williams, a UCSC senior Theater Arts major, says "There are people in this play I recognize from my own church." Williams, who has appeared in UCSC productions of "Phedre," " Ceremonies In dark Old Men," "For Colored Girls" and "The Devils," plays the central role of Sister Margaret, pastor the church, whose carefully constructed world of prayer and righteous living begins to fall apart when her beloved son David is seduced from accompanying services on the piano to playing with a jazz combo in a nightclub. Margaret has sought a hiding place from the world - including her husband’s life as a jazz musician - by withdrawing into the "amen corner." Baldwin describes her dilemma: "How to treat her husband and son as men and at the same time protect them from the bloody consequences of trying to be a man in this society … her need for human affirmation, and also for vengeance, expresses itself in her merciless piety; and turns her into a tyrannical matriarch." The play’s events move in swift sequence. Luke, the husband Margaret left years ago, reappears - terminally ill, seeking reconciliation, but unrepentant for the life he’s led. David declares his independence and leaves for the world. The church’s elders - all but Margaret’s sister Odessa - seize on her difficulties as evidence of her unfitness to be pastor, and oust her from the pulpit. At the moment of utter devastation, she experiences a revelation. As Baldwin describes it, "she has lost everything and gains the keys to the kingdom. The kingdom is love, and love is selfless, although only the self can lead one there. She gains herself." "The Amen Corner" boasts a cast of 30, and all but a very few are called upon to sing gospel music as fervently and beautifully as a real church congregation would. "We’ve gone around to different African-American churches in Santa Cruz, and observed some differences among different Baptist and Pentecostal worship," says director Don Williams (no relation to Jonelle). "Some praise the Lord by saying ‘Hallelujah’; some say "Thank you Jesus" Accompaniment might be drums, and keyboards, tambourines and guitars. Some are more delicate and refined - others are much less formal. It’s been truly wonderful for me and the cast, because everyone’s worked with us so generously - it has become a real community effort. "The play really grabs the grass roots of black experience. In the African-American community, the church is always a center point, and foundation for the black family. From early times, people found joy in singing gospel hymns, which in turn, of course, have a close relation to the blues," Williams says. Aifrcan-American students came together under Williams’ guidance to form the theater troupe more than a year ago, when they presented Lonne elder’s small-cast drama "Ceremonies in Dark Old Men." Audience loved it, awarding it standing ovations after every performance. "I saw it ws filling a void here on campus," Williams says. "Black students needed an opportunity to perform and express themselves, to promote understanding of African American culture. ‘Ceremonies showed that the University is a community black students can develop and grow in. So we felt inspired to do another show this year, and involve lots more people." Another inspiration for Williams and company was the chance for students to help other students. "We were all concerned that black student enrollment was dropping off each year at UCSC," says Jonelle Williams. "We decided to create a scholarship fund for African American students in the arts. It’s a great feeling to have a purpose; it’s been very positive. Now two other groups on campus are also involved, and we’re also getting a lot of non-arts majors to come out for the play." Through all performances of "The Amen Corner" will be free, audiences will be invited to contribute to the scholarship fund, which this year will provide grants of $500 each to three students. The grants will be awarded on opening night. One of the campus groups which has formed a natural alliance with the African-American Theater Arts Troupe is the African Gospel Ensemble, a campus choir whose performances are legendary for their electricity and enthusiasm. "There’s been quite a crossover. We’ve got several AGE members in the show," says Don William’s. "And now three or four of our actors have joined the choir!" William’s also enlisted the help of gospel expert Elsa Hendricks, a San Jose resident who has led workshops and coaching sessions with the "Amen Corner" cast. "She gave us such an understanding of those old songs were taught as children. She really made us understand how you have to feel it, how the rhythm is so important, and how to hod certain key verses and words to give the music the right impact." Though Jonelle William’s has an extensive background on stage, she never considered herself a singer. "When Don said I had to sing, I said ‘I can’t‘ Our choir director caught me trying to hide in the back of the group, and she helped me to sing out. It was o scary in the beginning, but we all supported each other, and now we love it! "I told Don ‘You’ve created a monster,’ because now I never stop singing." For the past two years, organizers of the African American Theater Arts Troupe (AATAT) have worked to expand the number of roles in the theater arts for African Americans at UCSC. Last year, their work paid off when the troupe’s performance of Ceremonies in Dark Old Men was a smashing success. Now, the troupe hopes the campus community will respond equally well to the newest AATAT production, The Amen Corner. "I saw the great need and the real potential for students of color t have a stronger participation in the world of theater," said AATAT director Don Williams. But Williams said the troupe is not limited to African Americans. "When we do plays, we open it up to anyone and everyone who wants to participate in the program, " said Williams. However, a large percentage of the troupe members are African American. According to Williams, is that the plays that the Troupe works on "utilize a great number of blacks because [they] were written by black artists…and developed and shaped to create the black image." Williams said that he is pleased with the troupe’s track record and the campus response. "The reactions [to the troupe] have been overwhelmingly positive," said Williams. "We have definitely been getting help from the Theater Arts board to continue our endeavors in bring forth plays of color." Along with performing plays, the troupe also raises funds for the African American Student Life Scholarship Fund (AASLSF). The fund was established to help retention of African American students on the UCSC campus. According to Williams, the troupe performance of Ceremonies in Dark Old Men last may raised $1,500 for the AASLSF through funds taken at the door. The money raised will be distributed to three African American students who members of the AASLSF , will benefit from the $500 grants this year. Last year’s production "definitely created a foundation" for the Troupe, said Williams. "Black students have the ability to stimulate and who their culture in a unique way," he said. " I think that [by being a part of the troupe, they] are clearly demonstrating that." Troupe members say they feel the production has helped build relationships between members of the African American community on campus. "I didn’t know a lot of the people in the cast," said Fitima Mariama Morris, who plays a solo singer in the upcoming play. " But we learned to work with other people and learned to deal with them." Troupe members say their experience s in the past productions have definitely set the stage for the future. "We have a commitment to the Troupe," said Keiko L. James, stage manager for The Amen Corner. "We have a common bond that brings us together." Next week, the UCSC African American Theater Troupe will present its second annual play, Amen Corner by James Baldwin. "The play cuts across the heart of the black community," said director Don Williams. "It depicts a battle of the minds, dealing with family and family values." Set in the early ‘60s on the East Coast, the play centers around the struggles of a single mother, Margaret Alexander, to raise her son David, and to follow what she sees as her spiritual calling as pastor in the local Pentecostal church." Margaret is very strong, but at the same time very proud," said senior theater arts major Joanell William’s, who plays Margaret. "I see her as a woman that retreats to the church after a painful marriage and the loss of her baby girl." Margaret faces criticism from church member Brother Boxer, who says the main reason she is working as a female pastor is because she is without "a man to rule over her." Margaret left her husband Luke, because his career as a jazz musician did not conform to her view of moral righteousness. Because of this, it is particularly upsetting to Margaret when her 18-year-old son David, wants to pursue jazz professionally also. "when the play begins," said Joanell Williams, "it has been ten years since the last time she saw her husband and she is very set in her ways. By the end, though, she sees that her way was not the only way." The main conflict in the play arises when Luke returns to reconcile with his family. "Luke is worldly, a womanizer, and he drinks a lot," said George Harris, a third year economics major, about his role in the play. "When he returns after ten years he is sick and realizes he is dying." According to Don Williams, the play deals with universal themes relevant to problems African American face today. "Raising kids together has been a struggle for the black male and female, which can be seen in the alarming percentage of black woman raising kids on their own, " he said. "This play deals with relationships, and the Bible says the godly plan for relationships is marriage. A man must learn to look upon his wife as a queen and to make sure she is happy and content." Director William’s said h chose this play because of the powerful writing style of James Baldwin. "The play has a very realistic, vivid quality that brings out a lot of truth from Baldwin’s characters," Williams said. Harris, who auditioned for the play partially because he admired Baldwin’s writing, said, "The beauty of the play is that it’s done in the vernacular, in a very straightforward way." 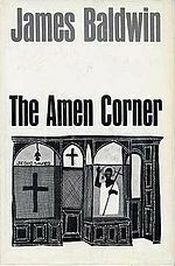 The role of the church within the black community is a central focus of Amen Corner, reflecting Baldwin’s own upbringing in a strongly religious family. Director William’s’ interpretation of the play highlights spiritual themes and the positive influence of the church for African Americans. "For blacks, the church has been an arena for hope and joy and peace," he said. "The church has clearly demonstrated its ability to rejuvenate people in a way that they can’t find anywhere else." The troupe visited various African American churches in Santa Cruz to get a strong feeling for the setting of the play and to better develop their parts. "African American churches have a definite style that is not as restricted, but that involved talking back and forth to the minister," said Joanell William’s. The production aims to represent church life as authentically as possible, so the progression of the drama is interspersed with singing and traditional gospel prayers. "There will certainly be a high, spiritual gospel energy flowing through the room," said Don William’s. "It would not surprise me if it made you want to get up and clap and sing."